If you walked down Grafton Street a few months ago you might have been lucky enough to watch Zar‘s performance. With a unique way of playing and incredible energy, this busker has a distinguished way of owning the crowd – he plays covers and original songs varying between lap tapping and fingerstyle. Zar is originally from Italy and moved to Ireland a couple of years ago to pursue the chance of living off his music. He started busking on the street and now plays gigs with his solo act and also with different bands he is part of. The Circular had the opportunity to talk to him about his journey to become a full-time musician. 1 – I know you came to Dublin with no English… Could you tell me a bit more about the experience of moving to another country to follow a dream? What are the difficulties in being a full-time musician? I moved to Dublin in 2015 because I was curious to know if what I read was true, and it is. Music everywhere and special people with no prejudices. It’s tough sometimes if you think while you’re busking that your music is measured by the money you count in the case. Otherwise, you become a coin machine. Without English, it’s quite hard and it limits you especially talking. But between meeting people, reading books, watching series I finally can express myself properly in another language. 2 – What were the advantages and disadvantages of busking? 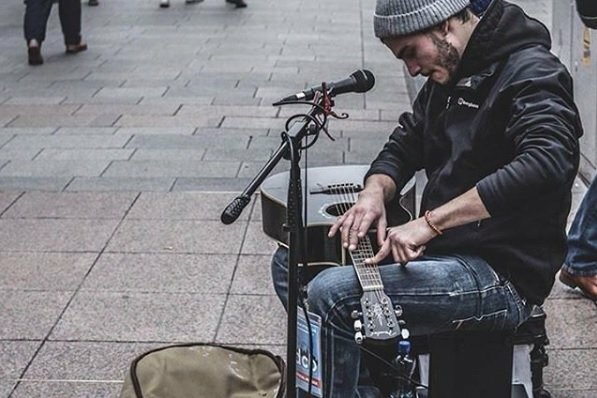 One great advantage of busking is that it gives the opportunity to practice playing while you make money so you can even do not work in a regular job and just focus on music. This is a choice though. Then you talk with people, you learn how to communicate your music to a crowd, present a song, everything you need for a stage or to another level of performance. I don’t really see disadvantages in busking. It is just about what you want to do with your music without being conditioned from the money you make. 3 – Where do you usually take your inspiration from? And that could mean anything, from music to people around you as well. Inspiration. Many artists that I follow and keep inspiring me are, for example, Tommy Emmanuel, Radiohead, Pearl Jam but mostly I take a lot of inspiration from the character of the people. How people walk, talk, think, that’s what I like to see when I’m around the city. Just admiring how many people there are and how they move in this fast and digital life. 4 – And most important, any piece of advice for other artists trying to live their dreams? I would say keep going thinking beyond the daily routine. If I was a poet a would say: live your choices and don’t be afraid.